No one can know what each of these expressions involves, except from the internal sense. It is manifest that every expression is in some respect representative and significative: as when it is said, that “heaven was opened”; that there was “a white horse”; that “there was One sitting upon him”; that “in justice He doth judge and make war”; that “His eyes were as a flame of fire”; that “on His head were many diadems”; that “He had a name that no man knew but He Himself”; that “He was clothed with a vesture dipped in blood”; that “the armies which were in heaven followed Him upon white horses”; that “they were clothed in fine linen white and clean”; and that “on His vesture and on His thigh He had a name written.” It is expressly said, that it is “the Word” which is here described, and the Lord who is the Word; for it is said, “His name is called the Word of God”; and afterwards, “He hath on His vesture and on His thigh a name written, King of kings and Lord of lords.” From the interpretation of each, expression it evidently appears, that the Word is here described as to its spiritual or internal sense. By “heaven being opened” is represented and signified, that the internal sense of the Word is seen in heaven, and thence by those in the world to whom heaven is opened. “The horse,” which was white, represents and signifies the understanding of the Word as to its interiors; that this is the signification of “a white horse,” will be shown presently. That “He that sat upon him” is the Lord as to the Word, thus the Word, is manifest, for it is said, “His name is called the Word of God”; who, from good, is called “faithful and judging in justice”; and from truth, is called “true, and who maketh war in justice”; for the Lord Himself is justice. “His eyes, as a flame of fire,” signify the Divine truth, from the Divine good of His Divine love. “The many diadems upon His head,” signify all the goods and truths of faith. “Having a name written that no one knew but He Himself,” signifies that the quality of the Word in the internal sense is seen by no one but Himself, and those to whom He reveals it. “Clothed in a vesture dipped in blood,” signifies the Word in the letter, to which violence has been offered. “The armies in the heavens which followed Him upon white horses,” signify those who are in the understanding of the Word as to its interiors. “Clothed in fine linen, white and clean,” signify the same persons in truth from good. “Upon His vesture and upon his thigh a name written” signifies truth and good, and their quality. From these particulars, and from those which precede and follow in that chapter, it is evident, that therein is predicted, that about the last time of the church the spiritual or internal sense of the Word would be opened; but what would come to pass at that time, is also described there (Apoc. 19:17-21). That this is the signification of the words mentioned, it is unnecessary to prove in this place, as they are particularly explained in The Arcana Coelestia; where it is shown, That the Lord is the Word, because He is the Divine truth (AC n. 2533, 2803, 2884, 5272, 7835). That the Word is the Divine truth (AC n. 4692, 5075, 9987). That because the Lord is justice, therefore it is said, that “He who sat upon the horse in justice doth judge and make war”; and that the Lord is called “justice” for this reason, because of His own power He has saved the human race (AC n. 1813, 2025-2027, 9715, 9809, 10019, 10152)- And that “justice” is the merit which belongs to the Lord alone (AC n. 9715, 9979). That “His eyes, as a flame of fire,” signify the Divine truth from the Divine good of the Divine love, is, because “the eyes” signify the understanding and the truth of faith (AC n. 2701, 4403-4421, 4523-4534, 6923, 9051, 10569); and “a flame of fire” signifies the good of love (AC n. 934, 4906, 5215, 6314, 6832). That “the diadem’s which were upon His head” signify all the goods and truths of faith (AC n. 114, 3858, 6335, 6640, 9863, 9865, 9868, 9873, 9905). That “He hath a name written which no one knew but He Himself,” signifies that the quality of the Word in the internal sense is seen by no one but Himself, and those to whom He reveals it, is because “a name” signifies the quality of a thing (AC n. 144, 145, 1754, 1896, 2009, 2724, 3006, 3237, 3421, 6674, 9310). That “clothed in a vesture dipped in blood,” signifies the Word in the letter, to which violence has been offered, is because “a vesture” signifies truth because it clothes good (AC n. 1073, 2576, 5248, 5319, 5954, 9212, 9216, 9952, 10536); especially truth in the ultimates, thus the Word in the letter (AC n. 5248, 6918, 9158, 9212); and because “blood” signifies violence offered to truth by falsity (AC n. 374, 1005, 4735, 5476, 9127). That “the armies in heaven followed Him upon white horses,” signify those who are in the understanding of the Word as to its interiors, is because “armies” signify those who are in the truths and goods of heaven and the church (AC n. 3448, 7236, 7988, 8019). And “a horse” signifies the understanding (AC n. 3217, 5321, 6125, 6400, 6531, 6534, 7024, 8146, 8318). And “white” signifies truth which is in the light of heaven, consequently interior truth (AC n. 3301, 3993, 4007, 5319). That “clothed in fine linen white and clean,” signifies the same persons in truth from good, is because “fine linen,” or “linen,” signifies truth from a celestial origin, which is truth from good (AC n. 5319, 9469). That “a name written upon the vesture and upon the thigh,” signifies truth and good, and their quality, is because “a vesture” signifies truth, and “a name” quality, as observed above, and “the thigh” signifies the good of love (AC n. 3021, 4277, 4280, 9961, 10485). “King of kings, and Lord of lords,” is the Lord as to the Divine truth and as to the Divine good; the Lord is called “King” from the Divine truth (AC n. 3009, 5068, 6148). And He is called “Lord” from the Divine good (AC n. 4973, 9167, 9194). Hence it appears what is the quality of the Word in its spiritual or internal sense, and that there is no expression therein which does not signify something spiritual, that is, something of heaven and the church. 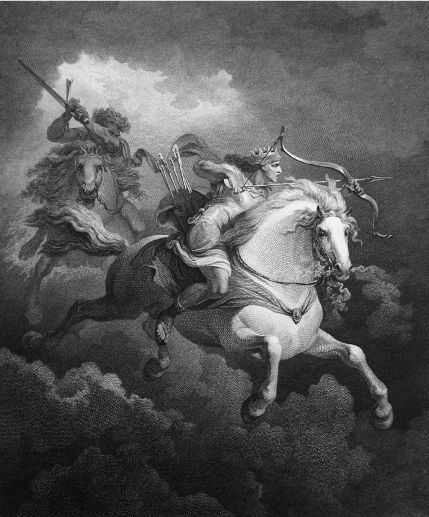 Dan is a serpent upon the way, an arrow-snake upon the highway, that biteth the horse’s heels, so that his rider shall fall backward (Gen. 17, 18). O God, Thou didst ride upon Thy horses. Thy chariots are salvation. Thou didst tread in the sea with Thy horses (Habakkuk 3:8, 16). In that day, there shall be upon the bells of the horses, holiness unto Jehovah (Zech. 14:20). In that day, saith Jehovah, I will smite every horse with astonishment, and his rider with madness; and I will open Mine eyes upon the house of Judah, and will smite every horse of the people with blindness (Zech. 12:4). God hath caused her to forget wisdom, neither hath He imparted to her intelligence: what time she lifteth up herself on high, she scorneth the house and his rider (Job 39:17, 18, 19). He rideth upon the word of truth (Ps. 45:4). My father, my father, the chariot of Israel and the horsemen thereof (2 Kings 2:11, 12). My father, my father, the chariot of Israel and the horsemen thereof (2 Kings 13:14). Jehovah opened the eyes of the boy of Elisha, and be saw and behold the mountain was full of horses and chariots of fire round about Elisha (2 Kings 6:17). The reason why Elijah and Elisha were called “the chariot of Israel and the horsemen thereof,” is because they both represented the Lord as to the Word, and “a chariot” signifies doctrine from the Word, and “horsemen” intelligence. That “Elijah” and “Elisha” represented the Lord as to the Word, may be seen in The Arcana Coelestia (AC n. 5247, 7643, 8029, 9327). And that “chariots” signify doctrine drawn from the Word (AC n. 5321, 8215). 3. That a horse signifies the understanding, is from no other source than from the representatives in the spiritual world. In that world horses are frequently seen, and persons sitting upon horses, and also chariots; and there everyone knows that they signify intellectual and doctrinal things. I have often observed, when any were thinking from their understanding, that at such times they appeared as if riding on horses; their meditation was thus represented before others, they themselves not knowing it. There is also a place there, where many assemble who think and speak from the understanding concerning the truths of doctrine; and when others approach, they see, the whole plain full of chariots and horses; and novitiate spirits, who wonder whence this is, are instructed that it is an appearance resulting from their intellectual thought. That place is called the assembly of the intelligent and the wise. I have likewise seen bright horses and chariots of fire, when some were taken up into heaven, which was a sign that they were then instructed in the truths of heavenly doctrine, and became intelligent, and thus were taken up; on seeing which, it occurred to my mind, what is signified by “the chariot of fire and the horses of fire by which Elijah was taken up into heaven”; and what is signified by “the horses and chariots of fire” that were seen by the young man of Elisha, when his eyes were opened. 4. That such is the signification of “chariots” and “horses” was well known in the ancient churches; for those churches were representative churches, and with those who were in them, the science of correspondences and representations was the chief of all sciences. The signification of the horse, as being understanding, was derived by the wise round about, even to Greece, from those churches. Hence it was, when they would describe the sun, in which they placed their God of wisdom and intelligence, that they attributed to it a chariot and four horses of fire. And when they would describe the God of the sea, since by the sea were signified sciences derived from the understanding, that they also attributed horses to him. And when they would describe the origin of the sciences from the understanding, they represented it by a winged horse, which with its hoof broke open a fountain, at which sat nine virgins called the sciences. For from the ancient churches they received the knowledge that “the horse” signifies the understanding; “wings,” spiritual truth; “the hoof,” what is scientific from the understanding; and “a fountain,” doctrine from which sciences are derived. Nor is anything else signified by “the Trojan horse,” than an artificial contrivance devised by their understanding for the purpose of destroying the walls. Even at this day, when the understanding is described after the manner received from those ancients, it is usual to figure it by a flying horse or Pegasus; so, likewise, doctrine is described by a fountain, and the sciences by virgins; but scarcely anyone knows, that “the horse,” in the mystic sense, signifies the understanding; still less that those significatives were derived by the Gentiles from the ancient representative churches. 5. Since “the White Horse” signifies the understanding of the Word as to its spiritual or internal sense, those particulars concerning the Word and that sense, which are shown in The Arcana Coelestia, are here subjoined: for in that work the whole contents of Genesis and Exodus are explained according to the spiritual or internal sense of the Word. THE WORD, AND ITS SPIRITUAL OR INTERNAL SENSE, FROM THE ARCANA COELESTIA. 6. The necessity and excellence of the Word. From the light of nature nothing is known concerning the Lord, concerning heaven and hell, concerning the life of man after death, nor concerning the Divine truths by which man acquires spiritual and eternal life (AC n. 8944, 10318, 10319, 10320) This may appear manifest from the consideration, that many, and among them men of learning, do not believe those things, although they are born where the Word is, and are thereby instructed pioneering them (AC n. 10319). Therefore it was necessary that there should be some revelation from heaven because man was born for heaven (AC n. 1775). Therefore in every age of the world there has been a revelation (AC n. 2895). Of the various kinds of revelation which have successively been made on this earth (AC n. 10355, 10632). To the most ancient men, who lived before the flood, chose time was called the golden age, there was an immediate revelation, and thence Divine truth was inscribed on their hearts (AC n. 9896). The ancient churches, which existed after the flood, had a historical and prophetical Word (AC n. 2686, 2897): concerning which churches see The New Jerusalem and its Heavenly Doctrine (HD n. 247). Its historical parts were called The Wars of Jehovah, and its prophetical parts, Enunciations (AC n. 2897). That Word, as to inspiration was like our Word, but accommodated to those churches (AC n. 2897). It is mentioned by Moses (AC n. 2686, 2897). But that Word is lost (AC n. 2897). Prophetical revelations were also made to others, as appears from the prophecies of Balaam (AC n. 2898). The Word is Divine in all and every particular part (AC n. 639, 680, 10321, 10637). The Word is Divine and holy as to every point and iota, from experience (AC n. 1349). How it is explained at this day, that the Word is inspired as to every iota (AC n. 1886). The church is especially where the Word is, and where the Lord is thereby known, and Divine truths are revealed (AC n. 3857, 10761). But it does not follow from thence, that they are of the church, who are born where the Word is, and where the Lord is thereby known; but they who, by means of truths from the Word, are regenerated by the Lord, who are they who live according to the truths therein, consequently, who lead a life of love and faith (AC n. 6637, 10143, 10153, 10578, 10645, 10829). 7. The Word is not understood, except by those who are enlightened. The human rational faculty cannot comprehend Divine, nor even spiritual things, unless it he enlightened by the Lord (AC n. 2196, 2203, 2209, 2654). Thus they only who are enlightened comprehend the Word (AC n. 10323). The Lord enables those who are enlightened to understand truths, and to discern those things which appear to contradict each other (AC n. 9382, 10659). The Word in its literal sense appears inconsistent, and in some places seems to contradict itself (AC n. 9025). And therefore by those who are not enlightened, it may be so explained and applied, as to confirm any opinion or heresy, and to defend any worldly and corporeal love (AC n. 4738, 10339, 10401). They are enlightened from the Word, who read it from the love of truth and good, but not they who read it from the love of fame, of gain, or of honor, thus from the love of self (AC n. 9382, 10548, 10549, 10550) They are enlightened who are in the good of life, and thereby in the affection of truth (AC n. 8694). They are enlightened whose internal is open, thus who as to their internal man are capable of elevation into the light of heaven (AC n. 10401, 10402, 10691, 10694). Enlightenment is an actual opening of the interiors of the mind, and also an elevation into the light of heaven (AC n. 10330). There is an influx of holiness from the internal, that is, from the Lord through the internal, with those who regard the Word as holy, though they themselves are ignorant of it (AC n. 6789). They are enlightened, and see truths in the Word, who are led by the Lord, but not they who are led by themselves (AC n. 10638). They are led by the Lord, who love truth because it is truth, who also are they that love to live according to Divine truths (AC n. 10578, 10645, 10829). The Word is vivified with man according to the life of his love and faith (AC n. 1776). The things derived from one’s own intelligence have no life in themselves, because from man’s proprium there is nothing good (AC n. 8941, 8944). They cannot be enlightened who have much confirmed themselves in false doctrine (AC n. 10640). It is the understanding which is enlightened (AC n. 6608, 9300). The understanding is the recipient of truth (AC n. 6242, 6608, 10659). In regard to every doctrine of the church, there are ideas of the understanding and of the thought thence, according to which the doctrine is perceived (AC n. 3310, 3825). The ideas of man during his life in the world are natural, because man then thinks in the natural; but still spiritual ideas are concealed therein, with those who are in the affection of truth for the sake of truth, and man comes into these ideas after death (AC n. 3310, 5510, 6201, 10236, 10240, 10550). Without ideas of the understanding, and of the thought thence, on any subject, there can be no perception (AC n. 3825). Ideas concerning the things of faith are laid open in the other life, and their quality is seen by the angels, and man is then conjoined with others according to those ideas, so far as they proceed from the affection which is of love (AC n. 1869, 3320, 5510, 6201, 8885). Therefore the Word is not understood except by a rational man; for to believe anything without an idea thereof, and without a rational view of the subject, is only to retain in the memory words destitute of all the life of perception and affection, which is not believing (AC n. 2533). It is the literal sense of the Word which admits of enlightenment (AC n. 3619, 9824, 9905, 10548). 8. The Word cannot be understood but by means of doctrine from the Word. The doctrine of the church must be from the Word (AC n. 3464, 5402, 6832, 10763, 10765). The Word without doctrine is not understood (AC n. 9025, 9409, 9424, 9430, 10324, 10431, 10582). True doctrine is a lamp to those who read the Word (AC n. 10401). Genuine doctrine must be from those who are in enlightenment from the Lord (AC n. 2510, 2516, 2519, 2524, 10105). The Word is understood by means of doctrine formed by one enlightened (AC n. 10324). They who are in enlightenment form for themselves doctrine from the Word (AC n. 9382, 10659). What is the difference between those who teach and learn from the doctrine of the church, and those who teach and learn from the sense of the letter of the Word alone (AC n. 9025). They who are in the sense of the letter of the Word without doctrine, do not come into any understanding concerning Divine truths (AC n. 9409, 9410, 10582). They may fall into many errors (AC n. 10431). They who are in the affection of truth for the sake of truth, when they become adults, and can see from their own understanding, do not simply abide in the doctrinals of their churches, but examine from the Word whether they be true or not (AC n. 5402, 5432, 6047). Otherwise everyone would have truth from another, and from his native soil, whether he were born a Jew or a Greek (AC n. 6047). Nevertheless such things as are become matters of faith from the literal sense of the Word, are not to be extinguished till after a full view (AC n. 9039). The true doctrine of the church is the doctrine of charity and faith (AC n. 2417, 4766, 10763, 10765). The doctrine of faith does not constitute the church, but the life of faith, which is charity (AC n. 809, 1798, 1799, 1834, 4468, 4677, 4766, 5826, 6637). Doctrinals are of no account, unless one live according to them; and everyone may see they are for the sake of life, and not merely for the memory and thought thence derived (AC n. 1515, 2049, 2116). In the churches at this day the doctrine of faith is taught, and not the doctrine of charity, the latter being rejected to a science, which is called moral philosophy (AC n. 2417). The church would be one, if they should he acknowledged as men of the church from the life, thus from charity (AC n. 1285, 1316, 2982, 3267, 3445, 3451, 3452). How much superior the doctrine of charity is to that of faith separate from charity (AC n. 4844) They who know nothing concerning charity, are in ignorance with respect to heavenly things (AC n. 2435). They who only hold the doctrine of faith, and not that of charity, fall into errors; which errors are also described (AC n. 2383, 2417, 3146, 3325, 3412, 3413, 3416, 3773, 4672, 4730, 4783, 4925, 5351, 7623-7677, 7752-7762, 7790, 8094, 8313, 8530, 8765, 9186, 9224, 10555). They who are only in the doctrine of faith, and not in the life of faith, which is charity, were formerly called the uncircumcised, or Philistines (AC n. 3412, 3413, 3463, 8093, 8313, 9340). The ancients held the doctrine of love to the Lord and of charity towards the neighbor, and made the doctrine of faith subservient thereto (AC n. 2417, 3419, 4844, 4955). Doctrine formed by one enlightened may afterwards be confirmed by things rational and scientific; and that thus it is more fully understood, and is corroborated (AC n. 2553, 2719, 2720, 3052, 3310, 6047). See more on this subject in The New Jerusalem and its Heavenly Doctrine (HD n. 51). They who are in faith separate from charity, would have the doctrinal of the church simply believed, without any rational intuition (AC n. 3394). It is not the mark of a wise man to confirm a dogma, but to see whether it be true before it is confirmed; and that this is the case with those who are in enlightenment (AC n. 1017, 4741, 7012, 7680, 7950). The light of confirmation is a natural light, and not spiritual, and may exist even with the evil (AC n. 8780). All things, even falsities, may be so far confirmed, as to a-pear like truths (AC n. 2482, 2490, 5033, 6865, 8521). 9. In the Word there is a spiritual sense, which is called the internal sense. No one can know what the spiritual or internal sense of the Word is, unless he knows what correspondence is (AC n. 2895, 4322). Each and all things, even the most minute, which are in the natural world, correspond to spiritual things, and thence signify them (AC n. 2890-2893, 2897-3003, 3213-3227). The spiritual things to which natural things correspond, as assume another appearance in the natural, so that they are not recognized (AC n. 1887, 2396, 8920). Scarcely anyone knows wherein resides the Divine of the Word, when nevertheless it is in its internal and spiritual sense, which at this day is not known even to exist (AC n. 2980, 4989). The mystical contents of the Word are no other than those of its internal or spiritual sense, which treats of the Lord, of the glorification of His Human, of His kingdom, and of the church, and not of the natural things which are in the world (AC n. 4923). The prophetic writings are in many places unintelligible, and therefore of no use, without the internal sense, illustrated by examples (AC n. 2608, 8020, 8398). As for instance, with respect to what is signified by “the white horse” in the Apocalypse (AC n. 2760). What by “the keys of the kingdom of the heavens,” that were given to Peter, see the preface to Genesis xxii., and (AC n. 9410). What by “flesh,” “blood,” “bread,” and “wine,” in the Holy Supper (AC n. 8682). What by the prophecies of Jacob concerning his sons (Gen. xlix. ; AC n. 6306, 6333-6465). What by many prophecies concerning Judah and Israel, which by no means tally with that nation, nor in the sense of the letter have any coincidence with their history (AC n. 6331, 6361, 6415, 6438, 6444). Besides many other instances (AC n. 2608). More may be seen of the nature of correspondence in the work on Heaven and Hell (HH n. 87-102, 103-115, 303-310). Of the internal or spiritual sense of the Word in a summary (AC n. 1767-1777, 1869-1879). In each and all things of the Word there is an internal sense (AC n. 1143, 1984, 2135, 2333, 2395, 2495, 2619). Such things do not appear in the sense of the letter, but nevertheless they are within it (AC n. 4442). 10. The internal sense of the Word is especially for the angels, and it is also for men. In order that it may be known what the internal sense is, the quality thereof, and whence it is, it may here be observed in general, that thought and speech in heaven are different from thought and speech in the world; for in heaven they are spiritual, but in the world natural; when, therefore, man reads the Word, the angels who are with him perceive it spiritually, whilst men perceive it naturally; hence it follows, that angels are in the internal sense, whilst men are in the external sense; but that nevertheless these two senses make a one by correspondence. That angels not only think spiritually, but also speak spiritually; that they are likewise present with man; and that they have conjunction with man by means of the Word, may be seen in the work on Heaven and Hell, where it treats of The Wisdom of the Angels of Heaven (HH n. 265-275). Of their Speech (HH n. 234-245). Of their Conjunction with Man (HH n. 291-302). And of their Conjunction by the Word (HH n. 303-310). There is an internal sense in the Word, and likewise an inmost or supreme sense, concerning which (AC n. 9407, 10604, 10614, 10627). The spiritual angels, or those who are in the spiritual kingdom of the Lord, perceive the Word in its internal sense; and the celestial angels, or those who are in the celestial kingdom of the Lord, perceive the Word in its inmost sense (AC n. 2157, 2275). The Word is for men, and also for angels, being accommodated to each (AC n. 7381, 8862, 10322). The Word is the means of uniting heaven and earth (AC n 2310, 2493, 9212, 9216, 9357). The conjunction of heaven with man is through the Word (AC n. 9396, 9400, 9401, 10452). Therefore the Word is called a covenant (AC n. 9396). Because a covenant signifies conjunction (AC n. 665, 666, 1023, 1038, 1864, 1996, 2003, 2021, 6804, 8767, 8778, 9396, 10632). There is an internal sense in the Word, because the Word is from the Lord, it descended through the three heavens even to man (AC n. 2310, 6397). And thereby it is accommodated to the angels of the three heavens and also to men (AC n. 7381, 8862). Hence it is that the Word is Divine (AC n. 2980, 4989). And it is holy (AC n. 10276). And it is spiritual (AC n. 4480). And it is Divinely inspired (AC n. 9094). This is inspiration (AC n. 9094). The regenerate man is actually in the internal sense of the Word, although he does not know it, since his internal man, which has spiritual perception, is open (AC n. 10401). But with him the spiritual of the Word flows into natural ideas, and thus is represented naturally, because while he lives in the world this spiritual thinks in the natural man, so far as it comes to the perception (AC n. 5614). Hence the light of truth, with those who are enlightened, is from their internal, thus through the internal, from the Lord (AC n. 10691, 10694). Also by the same way there is an influx of holiness with those who esteem the Word holy (AC n. 6789). Since the regenerate man is actually in the internal sense of the Word, and in the sanctity thereof, although he does not know it, therefore after death be comes into it of himself, and is no longer in the sense of the letter (AC n. 3226, 3342, 3343). The ideas of the internal man are spiritual; hut man during his life in the world does not attend thereto, inasmuch as they are within his natural thought, and give. it its rational faculty (AC n. 10236, 10240, 10500) But man after death comes into those his spiritual ideas, because they are proper to his spirit, and then lie not only thinks, but also speaks therefrom (AC u. 2470, 2478, 2479, 10568, 10604). Hence, as was said, the regenerate man knows not that he is in the spiritual sense of the Word, and that he receives enlightenment thence. Not one jot or one tittle shall pass from the law (Matt. 5:18). In the Word, particularly in the prophetical parts, there are two expressions which seem to signify the same thing. but one has relation to good, and the other to truth (AC n. 683, 707, 2516, 8339). In the Word goods and truths are conjoined in a wonderful manner, and such conjunction appears to him only who knows the internal sense (AC n. 10554). And thus in the Word, and in every part thereof, there is a Divine marriage and a heavenly marriage (AC n. 683, 793, 801, 2173, 2516, 2712, 5138, 7022). The Divine marriage is the marriage of Divine good and Divine truth, thus it is the Lord in heaven, in whom alone there is that marriage (AC n. 3004, 3005, 3009, 4158, 5194, 5502, 6343, 7945, 8339, 9263, 9314). Jesus also signifies the Divine good, and Christ the Divine truth, and thus both signify the Divine marriage in heaven (AC n. 3004, 3005, 3009). This marriage is in every particular part of the Word in its internal sense, and thus the Lord is therein as to the Divine good and the Divine truth (AC n. 5502). The marriage of good and truth from the Lord in heaven and in the church is called the heavenly marriage (AC n. 2508, 2618, 2803, 3004, 3211, 3952, 6179). Therefore in this respect the Word is as it were heaven (AC n. 2173, 10126). Heaven is compared in the Word to a marriage, on account of the marriage of good and truth therein (AC n. 2758, 3132, 4434, 4834). The internal sense is itself the genuine doctrine of the church (AC n. 9025, 9430, 10401). They who understand the Word according to the internal sense, know the true doctrine itself of the church, because the internal sense contains it (AC n. 9025, 9430, 10401). The internal of the Word is also the internal of the church, as it is likewise the internal of worship (AC n. 10460). The Word is the doctrine of love to the Lord, and of charity towards the neighbor (AC n. 3419, 3420). The Word in the literal sense is as a cloud, and in the internal sense it is glory. See the preface to Gen. xviii. and (AC n. 5922, 6343), where these words are explained: “The Lord shall come in the clouds of heaven with glory.” “Clouds” also in the Word signify the Word in the sense of the letter, and glory the Word in its internal sense. See the preface of Gen. xviii. and (AC n. 4060, 4391, 5922, 6343, 6752, 8106, 8781, 9430, 10551, 10574). Things contained in the literal sense, respectively to those which are in the internal sense, are like rude projections round a polished optical cylinder, from which nevertheless is exhibited in the cylinder a beautiful image of a man (AC n. 1871). In the spiritual world they who desire and acknowledge only the sense of the letter of the Word, are represented by a deformed old woman; but they who desire and acknowledge the internal sense at the same time, are represented by a virgin beautifully clothed (AC n. 1774). The Word in its whole complex is an image of heaven; for the Word is the Divine truth, and the Divine truth makes heaven, and heaven relates to one man, and therefore in this respect the Word is as it were an image of man (AC n. 1871). Heaven in one complex resembles one man, may be seen in the work on Heaven and Hell (HH n. 59-67). And the Divine truth from the Lord makes heaven (HH n. 126-140, 200-212). The Word is represented before the angels under the most beautiful and agreeable forms (AC n. 1767, 1768). The sense of the letter is as the body, and the internal sense as the soul of that body (AC n. 8943). Hence the life of the Word is from the internal sense (AC n. 1405, 4857). The Word is pure in the internal sense, but it does not appear so in the sense of the letter (AC n. 2362, 2396). The things which are in the sense of the letter are holy from the internal contents (AC n. 10126, 10728). The historical parts of the Word also have an internal sense, but within in them (AC n. 4989). Thus the historical as well as the prophetical parts of the Word contain arcana of heaven (AC n. 755, 1659, 1709, 2310, 2333). The angels do not perceive those parts historically, but dogmatically because spiritually (AC n. 6884). The interior arcana contained in the historical parts are less evident to man than those contained in the prophetical parts, by reason that the mind is engaged in viewing and considering the historical transactions (AC n. 2176, 6597). The nature of the internal sense of the Word is further shown (AC n. 1756, 1984, 2004, 2663, 3033, 7089, 10604, 10614) And illustrated by comparisons (AC n. 1873). 12. The Word is written by correspondences, and thus by representatives. The Word as to the sense of the letter is written by mere correspondences, that is, by such things as represent and signify the spiritual things of heaven and the church (AC n. 1404, 1408, 1409, 1540, 1619, 1659, 1709, 1783, 2179, 2763, 2899). This was done for the sake of the internal sense, which is there in every part (AC n. 2899). Consequently for the sake of heaven, since those who are in heaven do not understand the Word according to the sense of its letter, which is natural, but according to the internal sense, which is spiritual (AC n. 2899). The Lord spake by correspondences, representatives, and significatives, because He spake from the Divine (AC n. 9049, 9063, 9086, 10126, 10728). The Lord thus spoke before the world, and at the same time before heaven (AC n. 2533, 4807, 9049, 9063, 9086). The things spoken by the Lord went through the whole heaven (AC n. 4637). The historicals of the Word are representatives, and the words significative (AC n. 1540, 1659, 1709, 1783, 2687). The Word could not be written in any other style, so that through it there might be communication and conjunction with the heavens (AC u. 2899, 6943, 9481). They greatly err, who despise the Word on account of the apparent simplicity and rudeness of its style, and who think that they would receive the Word if it had been written in a different style (AC n. 8783). The method and style of writing which prevailed amongst the most ancient people, was by correspondences and representatives (AC n. 605, 1756, 9912). The ancient wise men were delighted with the Word, because of the representatives and significatives therein, from experience (AC n. 2592, 2593). If a man of the Most Ancient Church had read the Word, he would have seen clearly the things contained in the internal sense, and obscurely the things contained in the external sense (AC n. 449). The sons of Jacob were brought into the land of Canaan, because all the places in that land, from the most ancient times, were made representative (AC n. 1585, 3686, 4441, 5136, 6516). And thus the Word might be there written, wherein those places should be mentioned for the sake of the internal sense (AC n. 3686, 4447, 5136, 6416). But nevertheless the Word, as to the external sense was changed for the sake of that nation, but not as to the internal sense (AC n. 10453, 10461, 10603, 10604) Many passages adduced from the Word concerning that nation, which must be understood according to the internal sense, and not according to the letter (AC n. 7051). Inasmuch as that nation represented the church, and the Word was written with them and concerning them, therefore Divine celestial things were signified by their names, as by Reuben, Simeon, Levi, Judah, Ephraim, Joseph, and the rest: and by “Judah” in the internal sense is signified the Lord as to celestial love, and His celestial kingdom (AC n. 3654, 3881, 3882, 5583, 5782, 6362-6381). That it may be known what correspondences are and their nature, and what is the nature of representatives in the Word, something shall be here said concerning them. All things which correspond likewise represent, and thereby signify, so that correspondences and representations are one (AC n. 2890, 2897, 2971, 2987, 2989, 2990, 3002, 3225) The nature of correspondences and representations shown from experience and examples (AC n. 2703, 2987, 3002, 3213-3226, 3337-3352, 3472-3485, 4218-4228, 9280). The science of correspondences and representations was the chief science with the ancients (AC n. 3021, 3419, 4280, 4749, 4844, 4964, 4965, 6004, 7729, 10252). Especially with the Orientals (AC n. 5702, 6692, 7097, 7779, 9391, 10252, 10407). And in Egypt more than in other countries (AC n. 5702, 6692, 7097, 7779, 9391, 10407) Also with the Gentiles, as in Greece, and in other places (AC n. 2762, 7729). But that at this day the science of correspondences and representations is lost, particularly in Europe (AC n. 2894, 2895, 2994, 3630, 3632, 3747, 3748, 3749, 4581, 4966, 10252). Nevertheless this science is more excellent than all other sciences, inasmuch as without it the Word cannot be understood, nor the signification of the rites of the Jewish Church which are recorded in the Word, nor can it be known what the nature of heaven is, nor what the spiritual is, nor in what manner a spiritual influx takes place into what is natural, nor how the case is with respect to the influx of the soul into the body, with many other matters (AC n. 4180), and in the places above cited. All things which appear before spirits and angels, are representative according to correspondences (AC n. 1971, 3213-3226, 3457, 3475, 3485, 9481, 9574, 9576, 9577). The heavens are full of representatives (AC n. 1521, 1532, 1619). Representatives are more beautiful, and more perfect, in proportion as they are more interior in the heavens (AC n. 3475). Representatives there are real appearances, because they are from the light of heaven which is Divine truth, and which is the very essential of the existence of all things (AC n. 3485). The reason why each and all things in the spiritual world are represented in the natural world, is, because what is internal assumes to itself a suitable clothing in what is external, whereby it makes itself visible and apparent (AC n. 6275, 6284, 6299). Thus the end assumes a suitable clothing that it may exist as the cause in a lower sphere, and afterwards that it may exist as the effect in a sphere still lower; and when the end, by means of the cause, becomes the effect, it then becomes visible, or appears before the eyes (AC n. 5711). This may be illustrated by the influx of the soul into the body, whereby the soul assumes a clothing of such things in the body as enable it to express all its thoughts and affections in a visible form; wherefore thought, when it flows down into the body, is there represented by such gestures and actions as correspond to it (AC n. 2988). The affections of the mind are manifestly represented in the face, by the variations of the countenance, so as to be there seen (AC n. 4791-4805, 5695). Hence it is evident, that in each and all things in nature there lies hidden a cause and an end from the spiritual world (AC n. 3562, 5711). Since those things which are in nature are the ultimate effects, within which are the prior things (AC n. 4240, 4939, 5051, 6275, 6284, 6299, 9216). That internal things are the objects represented, and external things the objects representing (AC n. 4292). What is further meant by correspondences and representations may be seen in the work on Heaven and Hell, where it treats of the correspondence between all things of Heaven, and all things of Man (HH n. 87-102). Of the Correspondence of Heaven with all things on Earth (HH n. 103-115). And of Representatives and Appearances in Heaven (HH n. 170-176). Since all things in nature are representative of spiritual and celestial things, therefore in the churches which existed in ancient times, all the externals, which were rituals, were representative, and therefore those churches were called representative churches (AC n. 519, 521, 2896). The church instituted with the sons of Israel was a representative church (AC n. 1003, 2179, 10149). All the rituals therein were externals, which represented internals, which are of heaven and the church (AC n. 4288, 4874). The representatives of the church and of worship ceased when the Lord came into the world and manifested Himself, because the Lord opened the internals of the church, and because all things of that church in the highest sense regarded Him (AC n. 4832). 13. Of the sense of the letter, or the eternal sense of the Word. The sense of the letter of the Word is according to appearances in the world (AC n. 584, 926, 1719, 1720, 1832, 1874, 2242, 2520, 2533). And adapted to the conceptions of the simple (AC n. 2533, 9049, 9063, 9086). The Word, in the sense of the letter is natural (AC n. 8783). Because what is natural is the ultimate, wherein spiritual and celestial things find their limits, and upon which they rest like a house upon its foundation”; and that otherwise the internal sense of the Word, without the external, would he like a house without a foundation (AC n. 9360, 9430, 9433, 9824, 10044, 10436). The Word because it is such contains both a spiritual and celestial sense (AC n. 9407). And of consequence, that it is holy and Divine in the sense of the letter as to all and every part thereof, even to every iota (AC n. 639, 80, 1319, 1870, 9198, 10321, 10637). The laws enacted for the sons of Israel, although abrogated, are yet the holy Word, on account of the internal sense in them (AC n. 9210, 9259, 9349). Among the laws, judgments and statutes, ordained in the Israelitish or Jewish Church, which was a representative church, there are some which are still in force both in their external and internal sense; which ought strictly to be observed in their external sense; some which may be of use, if one is so disposed; and some which are altogether abrogated (AC n. 9349). The Word is Divine even in those statutes which are abrogated, on account of the heavenly things which lie concealed in their internal sense (AC n. 10637). What the quality of the Word is in the sense of the letter, if not understood at the same time as to the internal sense, or, what is the same thing, according to true doctrine from the Word (AC n. 10402). An immense number of heresies spring up from the sense of the letter of the Word without the internal sense, or without genuine doctrine drawn from the Word (AC n. 10401). They who are in externals without internals, cannot bear the interior things of the Word (AC n. 10694). The Jews were of this description and they are such also at the present day (AC n. 301-303, 3479, 4429, 4433, 4680, 4844, 4847, 10396, 10401, 10407, 10695, 10701, 10707). 14. The Lord is the Word. The Word in its inmost sense treats solely of the Lord, describing all the states of the glorification of His Human, that is, of its union with the Divine itself, and likewise all the states of the subjugation of the hells, and the reducing to order of all things therein, and in the heavens (AC n. 2249, 7014). Thus the inmost sense describes the Lord’s whole life in the world, and thereby the Lord is continually present with the angels (AC n. 2523). Therefore the Lord alone is in the inmost part of the Word, and the Divinity and the holiness of the Word is from thence (AC n. 1873, 9357). The Lord’s saying, that the Scripture was fulfilled concerning Him, signifies, that all things were fulfilled which are contained in the inmost sense (AC n. 7933). In the beginning was the Word, and the Word was with God, and God was the Word, and by it all things were made that were made; and the Word was made flesh (John 1:1-3, 14) ; (AC n. 2803, 2884, 5272, 7830). Further particulars concerning the creation of all things from the Divine truth, consequently by the Lord, may be seen in the work on Heaven and Hell (HH n. 137); and more fully in the article concerning the Sun in Heaven, where it is shown that the Lord is that Sun, and that it is His Divine love (HH n. 116-125). And that the Divine truth is Light, and the Divine good is Heat, proceeding from that sun in heaven (HH n. 126-140). The conjunction of the Lord with man is effected by the Word, by means of the internal sense (AC n. 10375). This conjunction is effected by each and all things of the Word, and herein the Word is more wonderful than all other writings (AC n. 10632-10634). Since the time of writing the Word, the Lord thereby speaks with men (AC n. 10290). for further particulars respecting the Conjunction of Heaven with man by means of the Word, see the work on Heaven and Hell (HH n. 303-310). 15. Of those who are against the Word. Of those who despise, blaspheme, and profane the Word (AC n. 1878). Their quality in the other life (AC n. 1761, 9222). They relate to the viscous parts of the blood (AC n. 5719). How great the danger is from profaning the Word (AC n. 571-582). How hurtful it is, if principles of falsity, particularly those which favor self-love and the love of the world, are confirmed by the Word (AC n. 589). They who are in no affection of truth for its own sake, utterly reject the things appertaining to the internal sense of the Word, and nauseate them, from experience of such in the world of spirits (AC n. 5702). Of some in the other life, who endeavored altogether to reject the interior things of the Word; such are deprived of rationality (AC n. 1879). 16. Which are the books of the Word. The books of the Word are all those which have the internal sense; but those which have not the internal sense are not the Word. The books of the Word in the Old Testament are, THE FIVE BOOKS OF MOSES; THE BOOK OF JOSHUA; THE BOOK OF JUDGES; THE TWO BOOKS OF SAMUEL; THE TWO BOOKS OF KINGS; THE PSALMS OF DAVID; THE PROPHETS ISAIAH, JEREMIAH, LAMENTATIONS, EZEKIEL, DANIEL, HOSEA, JOEL, AMOS, OBADIAH, JONAH, MICAH, NAHUM, HABAKKUK, ZEPHANIAH, HAGGAI, ZECHARIAH, MALACHI. In the New Testament, the four Evangelists, MATTHEW, MARK, LUKE, JOHN; and the APOCALYPSE. The rest have not the internal sense (AC n. 10325). The book of Job is an ancient book, which indeed contains an internal sense, but not in series (AC n. 3540, 9942). 17. Further particulars Concerning the Word. The term Word, in the Hebrew language, signifies various things; as speech, thought of the mind, every thing that really exists, and also something (AC n. 9987). The Word signifies the Divine truth and the Lord (AC n. 2533, 4692, 5075, 9987). Words signify truths (AC n. 4692, 5075). They signify doctrinals (AC n. 1288). The ten words signify all Divine truths (AC n. 10688). In the Word, particularly in the prophetic parts, there are two expressions that signify one thing, and the one has relation to good and the other to truth, which are thus conjoined (AC n. 683, 707, 5516, 8339). It can be known only from the internal sense of the Word, what expression refers to good and what to truth; for there are proper words by which things appertaining to good are expressed, and proper words by which things appertaining to truth are expressed (AC n. 793, 801). And this so determinately, that it may be known merely from the words made use of, whether the subject treated of is good, or whether it is truth (AC n. 2722). Sometimes also one expression involves a general, and the other expression implies a certain specific particular from that general (AC n. 2212). There is a species of reciprocation in the Word, concerning which see (AC n. 2240). Most expressions in the Word have also an opposite sense (AC n. 4816). That the internal sense proceeds regularly according to the subject predicated (AC n. 4502). They who have been delighted with the Word, in the other life receive the heat of heaven, wherein is celestial love, according to the quality and degree of their delight from love (AC n. 1773). END OF THE WHITE HORSE.